Western Isles Cruises is our local ferry and fast water taxi service for guests at Knoydart Hide. Privately owned this family business also doubles as our highland contract ferry service. Ferries run several sailings a day, seven days a week and all sailings tie in with trains times and Knoydart Hide arrival departure times (fast crossing). 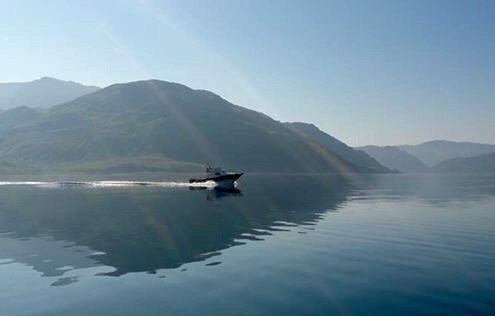 The sailing crosses a sheltered sea loch bringing our guests, groceries, Knoydart residents deliveries and whatever else needs to arrive. Ferries tie in with rail services. Knoydart Hide will be ready for you from 3pm on date of arrival which ties in with the 2.15pm sailing. 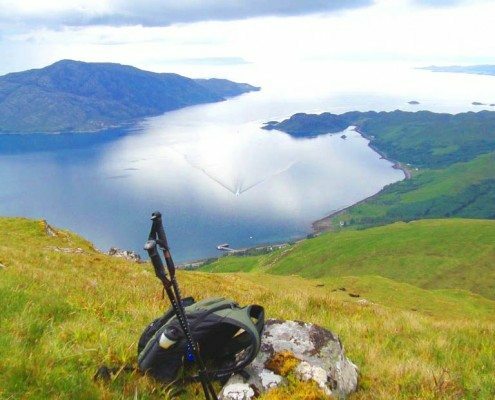 We meet you on arrival with a vehicle to take you up to Knoydart Hide. It’s only a 5 minute walk to the property but saves carrying anything – you are on holiday after all! We also collect you on departure. They take bikes and kayaks too. So even when the larger calmac ferries may not be able to run our Knoydart boats will get you here. Please note there are NO roads in to Knoydart! The only vehicular route is by taking the A830 ‘Road to the Isles’ to Mallaig from Fort William, and then hopping on a passenger ferry. Allow yourself 1-1½ hours from Fort William to Mallaig. 3½ – 4 hours from Glasgow to Fort William. When you get to Mallaig there is a parking bay to your left before you reach the roundabout at the approach. Local cars live here while we live on Knoydart, cars are always left at owners risk wherever parked in Mallaig but this is probably your best option. Head first to the pier to drop your bags off to save a walk with luggage. All trains to Fort William and Mallaig go via Glasgow. For more information visit the rail timetable. Best bet to make your own arrangements or telephone 08457 48 49 50. The train journey is spectacular and Wanderlust Travel Magazine voted the line from Fort William to Mallaig as the best in the country, beating off stiff competition from the Orient Express, now that takes some beating! Travelling on the overnight sleeper from London is fun and comfortable. Visit the the rail timetable at Scotrail for details (see link above), or call 08457 48 49 50. Trains travelling from London stop in Fort William. Here you pick up a connection for Mallaig. ‘The Jacobite’ steam train runs in the Summer months. Travel back in time and cross the famous viaduct, just like that famous little wizard on his way to Hogwarts! Details here: Steam Train Jacobite. Some people like a challenge – a minimum of two days trekking and camping. If you are interested in walking in to Inverie from Kinlochhourn, Glenfinnan, or anywhere else, contact our Ranger Service, who can provide advice on this well walked route. Please note, there is no signage on any of the routes. Don’t attempt to walk in unless you have the correct map and a compass, know how to use them, and have a clear route in mind. Experience of walking routes without signage is essential. You will need adequate safety and protective equipment, including rainwear, tent or goretex bivvy bag, plus decent boots, etc. Please always inform a friend or relative of your route and the time you expect to take.